Editor’s Note: The following article was contributed by Manuel Müller with Daimler. 60 years ago, Stirling Moss won the “Mille Miglia” in Italy in the best time ever achieved in the legendary 1,000-mile race, at the wheel of the Mercedes-Benz 300 SLR racing sports car with the starting number 722. The winning vehicle is now set to be the star of Mercedes-Benz Classic’s appearance in hall 1 at the Techno Classica show, which will take place at the Messe Essen exhibition centre from 15 to 19 April 2015. The other main focus for the Stuttgart-based brand at the 27th Techno Classica will be on the unique history of streamlined car design from Mercedes-Benz. Seven elegantly sporty vehicles embodying this innovative and aesthetic tradition will be on show, ranging from the “Blitzen-Benz” of 1909 to the current Mercedes-Benz CLA 45 AMG Shooting Brake from 2015. The Mercedes-Benz ClassicPartner concept is also to be presented for the first time. Sleek, streamlined design emerged as an objective in car development back in the first third of the 20th century. Engineers and designers recognised that the higher a vehicle’s top speed became as a result of advances in engine and chassis technology, the more important optimised air resistance became. One of the early highlights of the culture of innovation which gave rise to this realisation was the Benz 200 HP from 1909. At the Techno Classica 2015, this vehicle, which attained world fame as the “Blitzen-Benz”, provides the starting point for an array of exclusive, sporty vehicles charting the course of special aerodynamic design throughout the history of the Mercedes-Benz brand. Following in the tradition of this high-performance motor car, Mercedes-Benz Classic is also presenting two subsequent vehicles which were built as one-off models for high-speed record runs: with the twelve-cylinder record-breaking car of 1936 which was developed on the basis of the W 25 Grand Prix racing car, Rudolf Caracciola attained a top speed of 372.1 km/h. Four decades later, in 1978, the Mercedes-Benz engineers refined the C 111 research vehicle dating from 1969 to produce the C 111-III record-breaking car, which set nine absolute world records in Nardò, Italy, with its five-cylinder diesel engine. A milestone on the road to scientific research into air resistance was marked by the Mercedes-Benz 540 K Streamliner (W 29) based on the brand’s sporty top-of-the-line model of the time. Even when stationary, the breathtakingly beautiful form appears to promise that this car built in 1938 is faster than the wind. Apart from the profile with its flowing lines, a key contributory factor to the excellent drag coefficient of only cd = 0.36 was the systematic reduction of drag sources – including a panelled underbody. In this way, the Streamliner put research findings into practice. Outstanding aerodynamics and excellent sporty attributes are also characteristic features of successful racing cars. Mercedes-Benz Classic is highlighting this at the Techno Classica with the 2nd-generation Silver Arrows which dominated international motor sport in 1954 and 1955: the 2.5-litre Formula 1 racing car with streamlined body dates from 1954. It was with this aerodynamically optimised version of the W 196 R racing car that Mercedes-Benz 1954 re-entered Grand Prix sport in the first race for the French Grand Prix. The double victory with Juan Manuel Fangio finishing ahead of Karl Kling went down in racing history as the “Miracle of Reims”, and Fangio collected his first world championship title for Mercedes-Benz – a feat which he duly repeated in 1955. The Mercedes-Benz engineers also developed the 300 SLR (W 196 S) racing car on the basis of the Formula 1 racing car for the 1955 season. This is the vehicle in which Stirling Moss and Denis Jenkinson won the 1955 Mille Miglia in such convincing style. The 300 SLR on show in Essen with the starting number 722 commemorates this legendary triumph. The wins notched up by the 300 SLR throughout the season secured the World Sportscar Championship in 1955. Research findings in the field of aerodynamics and experience acquired in motor racing and record runs are incorporated into the development of Mercedes-Benz production vehicles. In conjunction with particularly sporty concepts and powerful drive systems, a continuing succession of vehicles emerge such as the Mercedes-Benz E 500 (W 124) and the current CLA 45 AMG Shooting Brake (X 117). The refined E 500 sports saloon was originally launched as the 500 E in 1991. It was the top model of the 124 model series, whose development was also shaped by the aerodynamic optimisation of the saloon bodies. The CLA 45 AMG Shooting Brake has entered the marketplace in 2015 as the fourth high-performance motor car of the current Mercedes-Benz compact class. It sets benchmarks in aerodynamics and design, performance and efficiency. In the context of the Mercedes-Benz presentation at the Techno Classica the compact high-performance car shows how core strengths from the brand’s history point towards the future of Mercedes-Benz. ClassicPartner is a network of Mercedes-Benz outlets throughout Germany which pools the expertise of proven specialists in all matters relating to classic Mercedes-Benz vehicles. These outlets offer high-quality vehicles and optimum service, including the supply of replacement parts. The network currently comprises 24 dealers. The website www.mercedes-benz.com/classic-partner presents the range of services offered by Mercedes-Benz ClassicPartner and offers a convenient dealer search function. Mercedes-Benz Cars Sales Germany is presenting the concept together with a number of ClassicPartners and their range of vehicles offer for sale at the Techno Classica in hall 3. The 27th Techno Classica will be held at the Messe Essen exhibition centre from 15 to 19 April 2015. The show for classic vehicles has the motto “Share the passion” and is the largest event of its type worldwide. More than 25 car brands and well over 200 brand clubs will feature with their own presentations at the Techno Classica. In all, the organisers are expecting some 1,250 exhibitors and more than 190,000 visitors. The Techno Classica opens its doors for “Happy View Day” from 2 p.m. until 8 p.m. on Wednesday 15 April 2015. From Thursday 16 April to Sunday 19 April 2015, the exhibition centre will then be open daily from 9 a.m. to 6 p.m.
At the beginning of the 20th century, racing drivers and car manufacturers were dreaming of breaking the then magic speed mark of 200 km/h. Benz achieved this record for the first time with a petrol-engine vehicle: the Mannheim brand’s record-breaking 200-hp car attained an average speed of 202.7 km/h on the Brooklands circuit in England in 1909. It was in Florida (USA), however, that this vehicle fitted with a giant four-cylinder engine enjoyed its greatest successes. In 1911, Bob Burman clocked up a fantastic 228.1 km/h here on the sand track at Daytona beach. This made the “Blitzen-Benz”, as the model was known in the USA, the fastest vehicle in the world – even faster than any aeroplane or train. The record was to stand for eight years. The W 25 record-breaking car of the 1936 season was a one-off special model designed on the basis of a standard chassis of the W 25 Grand Prix racing car of 1935. For the first time in the history of car manufacturing, a chassis was provided with a fully streamlined body which also included the wheels and the underside of the car. In the wind tunnel at the Zeppelin plant in Friedrichshafen, the experts analysed the body’s air flow characteristics and optimised its aerodynamics. The resultant record-breaking car acquired outstanding prominence as the pioneer of aerodynamics as a systematically and precisely applied science in automotive design. To power the vehicle, the Mercedes-Benz engineers opted for the proven MD 25 DAB engine, which generated an output of 453 kW (616 hp) in the record-breaking car. This was around 60 kW (82 hp) more than the eight-cylinder in-line engine of the Grand Prix racing car. On 26 October, Rudolf Caracciola set three international records with the record-breaking car in the “B” class (5 to 8 litres displacement) over a 1-kilometre run, a 1-mile (1,609.34 m) run and a 5-mile run (8,046.72 m), each with a flying start. He reached a top speed of 372.1 km/h in these runs. The record-breaking series continued on 11 November. Caracciola set two new class records for the 5-mile and the 10-kilometre runs. Topping off the record breaking attempts was a world record over 10 miles (16,093.44 m) with a flying start: in it Caracciola reached an average speed of 333.5 km/h between two runs in both directions. 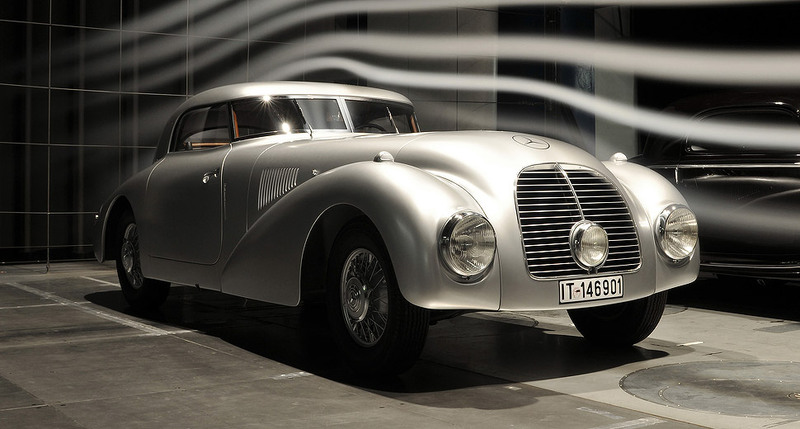 The Mercedes-Benz 540 K Streamliner, built in 1938, crowned the development of aerodynamically optimised Mercedes-Benz vehicles in the 1930s. The one-off model based on the Stuttgart-based brand’s sporty top model set both technical and aesthetic standards. With this vehicle, Mercedes-Benz spearheaded a trend which was occupying the entire motor car industry at the time: the rapid pace of technical progress and the growing network of highways raised the possible speed of travel. Against this background, the aerodynamics of powerful passenger cars acquired increasing importance, specifically with regard to efficiency aspects, too. With the flowing lines and the low profile of its aluminium body, the minimised drag sources on its surfaces and the panelled underbody, the Streamliner applied the findings of research in exemplary manner – with a sensationally low drag coefficient of cd = 0.36. Following extensive restoration, Mercedes-Benz presented the vehicle to the public once again in 2014. In 1954 Mercedes-Benz returned to Grand Prix with a completely newly developed racing car. The W 196 R was built in accordance with the conditions of the new Grand Prix formula defined by the CSI (Commission Sportive Internationale). These conditions included a displacement limit of 750 cc with supercharger or 2,500 cc without a supercharger. The fuel composition was arbitrary. The Mercedes-Benz engineers developed a 2.5-litre engine which initially produced an output of 188 kW (256 hp) at 8,260 rpm from a displacement of 2,496 cc. In 1955, the output duly rose to 213 kW (290 hp) at 8,500 rpm. The aerodynamically optimised streamlined version was the first to be built for the 1954 season, because the first race in Reims (France) allowed very high speeds. A second variant with open wheels followed in due course. The spaceframe of the W 196 R was light and sturdy; the chassis had a torsion-rod suspension and a new single-joint swing rear axle as well as huge turbo-cooled Duplex drum brakes. To power the vehicle, the engineers chose an eight-cylinder in-line engine with direct injection and desmodromic (positively opened and closed) springless valves, which made high engine speeds above 8,000 rpm possible. In the opening race, the French Grand Prix on 4 July 1954, Juan Manuel Fangio and Karl Kling drove W 196 R streamlined racing cars to a double victory. Fangio finished the season as World Champion. In the improved version of the streamlined car, he also won the last race in which the W 196 R competed – the 1955 Italian Grand Prix. This sealed Fangio’s second world championship title driving the Silver Arrows. With the 300 SLR (W 196 S), Mercedes-Benz won the World Sportscar Championship in 1955. The vehicle is basically a type W 196 R Formula 1 racing car with a two-seater sports car body. The main technical difference is to be found in the engine: the racing sports car, not being bound by the Formula 1 regulations limiting the engine’s displacement, was powered by a three-litre version of the eight-cylinder in-line engine and featured cylinder blocks made not from steel, but from light-alloy. 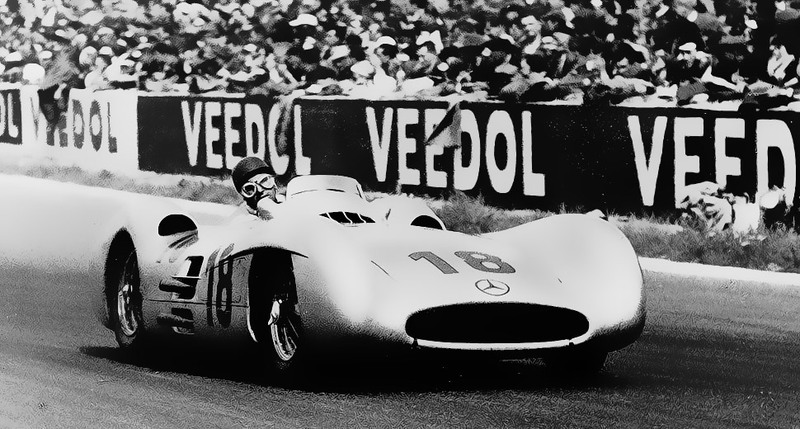 In addition, the 300 SLR ran on regular premium-grade petrol, as opposed to special methanol-based racing fuel. Its output of 228 kW (310 hp) and its durability and reliability made the 300 SLR far superior to its competitors of 1955 – a fact it went on to prove with its double victories at the Mille Miglia, in the Eifel race, the Swedish Grand Prix and the Targa Florio (Sicily). At the 1955 Mille Miglia, Stirling Moss and his co-driver Denis Jenkinson (starting number 722) came in first with an average speed, unequalled to this day, of 157.65 km/h. The track record of this sports car remains unique: the W 196 S won every single race the Mercedes-Benz 300 SLR entered and finished. In the family of Mercedes-Benz C 111 experimental and record-breaking vehicles, the C 111-III was the first thoroughbred vehicle whose body was rigorously designed with a focus on optimising aerodynamics. Its development in 1977 was spurred on by the success of the C 111-IID in record runs conducted in Nardò. While this first C 111 fitted with a diesel engine was largely based on the chassis of the Wankel-powered C 111-II coupé from 1970, the new record-breaking car was designed from scratch under the direction of Professor Dr Hans Scherenberg. The completely new, aerodynamically optimised body, which was developed in extensive wind tunnel tests, was crucial to the vehicle’s success. 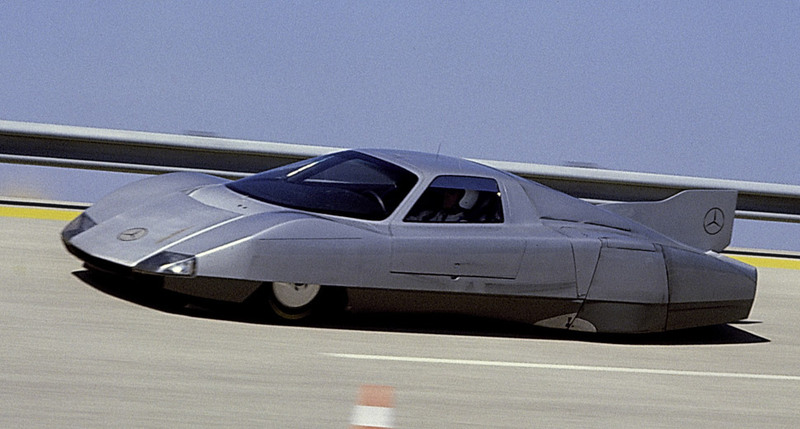 The vehicle was more slender than the C 111 research vehicles from 1969 and 1970. It had a longer wheelbase, and full underbody panelling plus tailfins assured it of perfect aerodynamics. Again a five-cylinder in-line diesel engine roared beneath the plastic body, now painted silver. The further enhanced engine now generated an output of 169 kW (230 hp), however, and enabled the streamlined car to attain speeds beyond 300 km/h. In 1978, the C 111-III was used in record-breaking attempts in Nardò. It clocked up nine absolute world records, including an average speed of 319 km/h over 1,000 miles (1,609.344 m). Mercedes-Benz presented the 500 E model as an eminently august sporty performer at the Paris Motor Show in October 1990. While at first glance barely distinguishable from its sister models, the new top model of the 124 model series boasted performance figures that clearly placed it in a different league. The sports saloon was powered by a 235 kW (320 hp) five-litre V8 four-valve engine based on the proven M 119 E 50 engine of the 500 SL (R 129). With the standard-fitted four-speed automatic transmission, the 500 E accelerated from 0 to 100 km/h in 5.9 seconds. The top speed was limited to 250 km/h. The top model of the W 124 model series was lowered by 23 millimetres, featured discreet wheel arch flaring and came as standard with acceleration skid control (ASR). From June 1993, when the new nomenclature for the Mercedes-Benz passenger cars entered into force and the mid-size model series was allocated the name “E-Class”, the ultra-sporty V8-powered top model bore the designation E 500. The 265 kW (360 hp) Mercedes-Benz CLA 45 AMG Shooting Brake has been causing a stir since March 2015 as the sporty top model of the X 117 model series. This fourth high-performance motor car of the successful compact class family from Mercedes-Benz is fitted with the most powerful series production four-cylinder turbo engine in the world, with a displacement of 1991 cubic centimetres. The Shooting Brake is distinguished by a roof contour featuring a dynamic sporty profile and a gentle downward slope towards the rear. At the same time, the vehicle offers more headroom than the four-door CLA Coupé. The attractive engineering package for the CLA 45 AMG Shooting Brake includes the AMG SPEEDSHIFT DCT 7-speed sports transmission, fully variable AMG Performance 4MATIC all-wheel drive, the powerful brake system and the specially developed suspension. The sporty motor car accelerates from a standing start to 100 km/h in 4.7 seconds.